kt literary » Blog Archive » SOLD!!! Congratulations to Emmie Mears! SOLD!!! Congratulations to Emmie Mears! Please help us celebrate with Emmie Mears whose fourth book in her urban fantasy AYALA STORME series has sold to Audible for audiobook production! 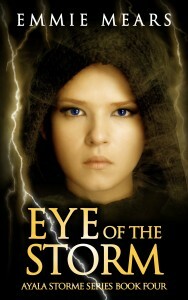 EYE OF THE STORM releases this June and will be narrated (again!) by the amazing TV star Amber Benson – we couldn’t be more thrilled. Thanks to Audible and to Amber for their tremendous support of this series! Author of STORM IN A TEACUP, Emmie Mears’s EYE OF THE STORM, the fourth book in her urban fantasy series about a powerful Mediator in her final war against the demons threatening Earth, to Lee Jarit at Audible, narrated by TV star Amber Benson, in a nice deal, by Sara Megibow of kt literary (World). Earth teeters on the edge of a razor sharp blade. With the Summit on barely-unified tenterhooks and hellkin bubbling into Earth with no sun to stop them, Ayala Storme has her hard-won family, an uncertain new love, and a team of allies — half of whom have betrayed her in the past. When the cities of North America begin to fall to demon hordes, Ayala has to fight her way back into Nashville in a desperate hope to save her city. With the witches trying to find the original source of the imbalance that allows hellkin a tie to Earth and the Mediators ready to draw their swords every time they see a shade, time is ticking away. The witches are working as fast as they can, but what they find may shake the foundations of everything Ayala has ever known — and the answers needed to salvage what’s left of Earth may only lie beyond Earth itself, in the sixth hell. The battles are over. It’s time for the war. ← Welcome to Margaret Rogerson!